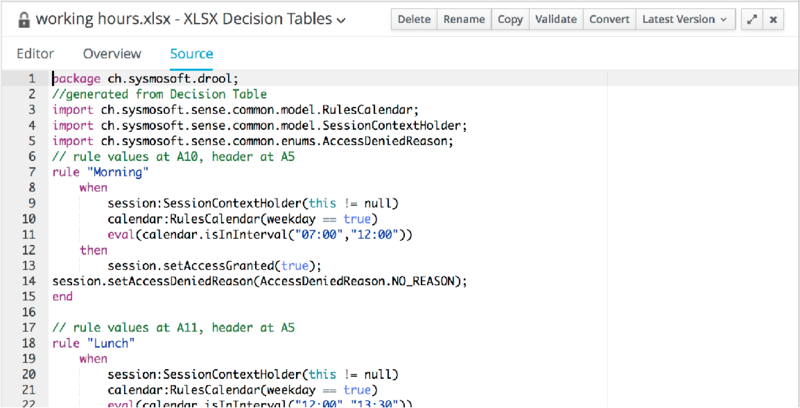 This configuration guide helps developer to create business rules that can be interpreted by ZENworks Mobile Workspace rule engine. Therefore, access rights and security policies can be modified on the fly based on the mobile context and user’s metadata. For ZENworks Mobile Workspace, the following concept has been developed: As an input, the application gather all information it can retrieved on the device and in the server configuration to create a request context. On the other hand, developers or business analysts create rules, based on this context, to modify on the fly security policies and access rights. This section list all objects/attributes that can be used to take decision. This section list all objects/attributes that can be modified depending on the condition. UNTRUSTED_DEVICE: Set when the access is denied because of a forbidden device. UNTRUSTED_NETWORK: Set when the access is denied because of the network from where the request is coming. DISALLOWED_APPLICATION: Set when the access is denied because the application is not allowed for the user. LOCATION_REQUIRED: Set when the access is denied because the location of the user is required. NO_REASON: Set when above reasons does not fit the situation. Drools is the rule engine embedded in ZENworks Mobile Workspace which understand its own “native” rule language. This document does not aims to teach developers how to write rules as details document is available here: https://docs.jboss.org/drools/release/5.2.0.Final/drools-expert-docs/html/ch05.html. Using drools language is for expert that have knowledge in Java development and want to create complex rules that may require external libraries. Please refer to existing samples for quick start. To quickly install the workbench, the best is to install Docker and install the drools workbench showcase image. As we have seen in the previous chapter, drool language must be created by developers. However, most of the time, they are not those who will match business needs and rules. Business analyst for example knows the business needs but are unlikely to develop a rule. Therefore, developer needs to provide them an easiest way to create rules. Setup of these files must still be done by java developer but when it is ready, the Excel file can be provided to business analyst. Please refer to existing samples for quick start. The current version of ZENworks Mobile Workspace is not able to upload Excel spreadsheet directly. It must be converted with drools workbench into a DRL file. Log in the ZENworks Mobile Workspace administration console as an administrator. Click on the GENERAL menu. Go under the Contextual rules tab. Put a name and a version. Go under the Security settings tab. Edit the desired settings (or create a new one). In the Rules package section, Enable rules execution ? by checking the box. Select the desired rule by clicking in the radio button.